"If you like Pina Coladas, getting caught in the rain"
That pretty much sums up our time in Puerto Rico. Drinks and the occasional downpour. Lucky for us, the rain were mere sprinkles and the sun was still shining. We were sick of shelling out the $20.00-25.00 cab fare from Isla Verde to Old San Juan so we decided to save money and take public transportation. We were told the buses were not reliable but we took the risk anyway. We waited at a bus stop for a good 30 minutes before the right bus came along. When we got on, I thought, "Finally, AC, this won't be so bad." To my surprise, their was a crazy "possessed" guy on the bus yelling vulgar profanity for the whole 45 minute ride. It was really awkward and uncomfortable. 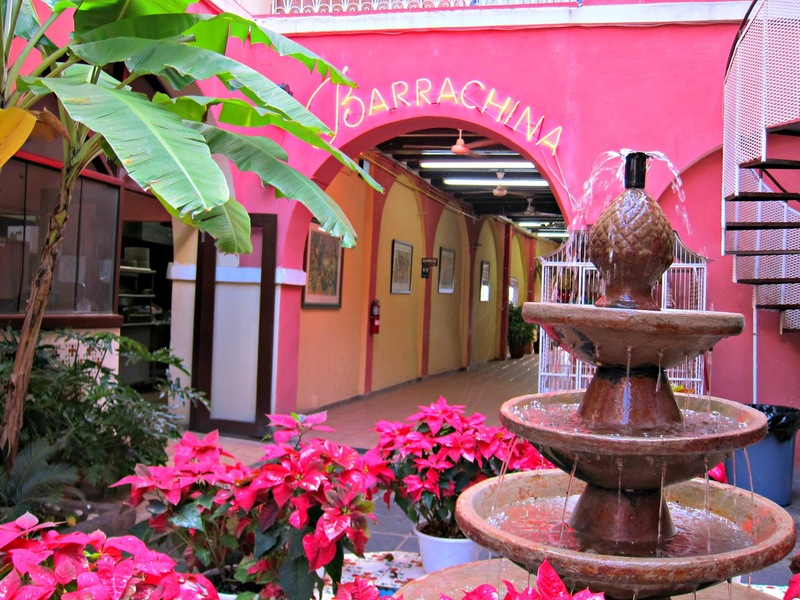 We arrived to Barrachina a little past noon and seated in the beautiful courtyard. 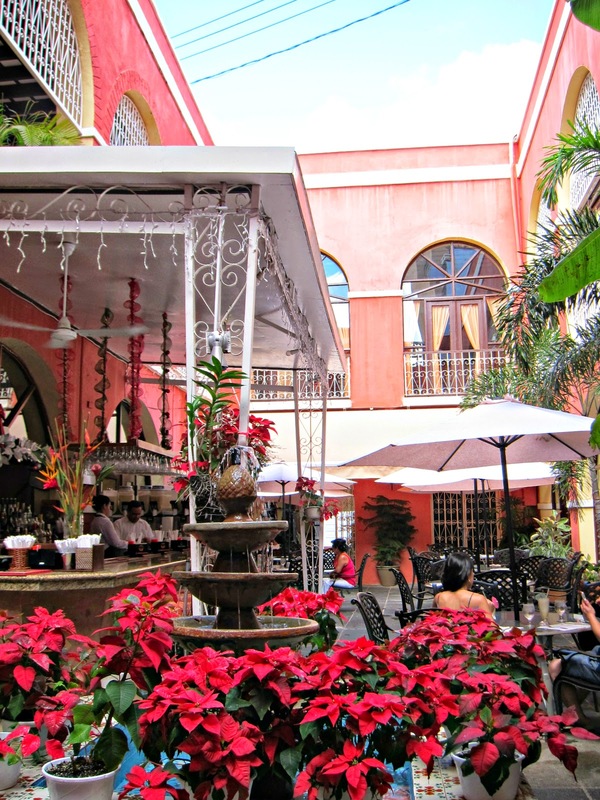 It was so cool to see poinsettias in a hot climate. I usually associate the red holiday plants with Christmas in New England. We tried samples of the premade frozen pina coladas and my mom and I each got one. The Mo settled for a beer instead. 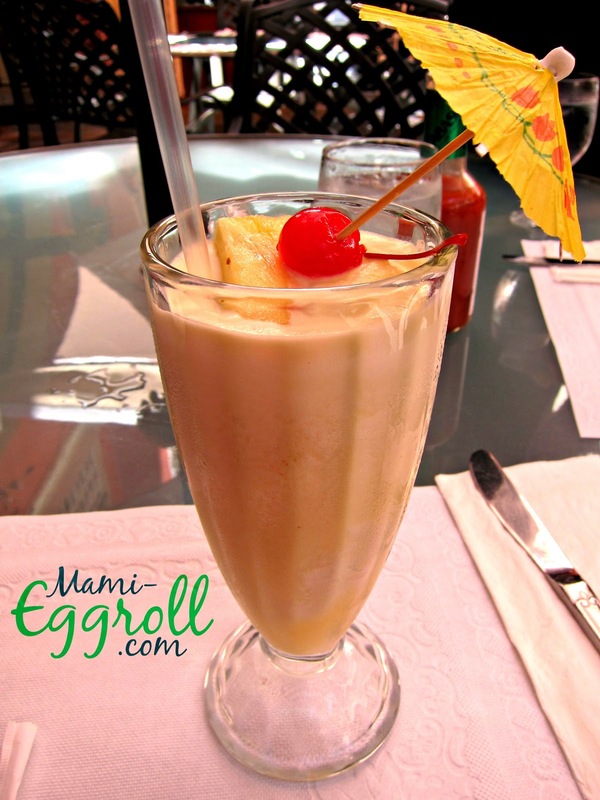 There are actually tours that bring you by this restaurant to try a sample of the Pina Colada. Why pay the money when you can easily walk in and order a full size glass? 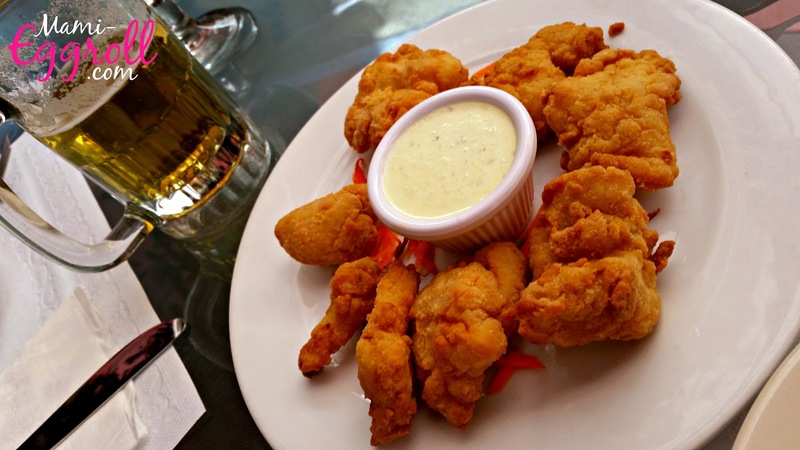 For an appetizer, we split the Grouper Fritters that was described on the menu as filet strips breaded with coconut and served with tarter sauce. When the dish came out, there were no evidence of coconut and the batter was plain. The Mo got a steak sandwich that resembled a steak bomb sub. 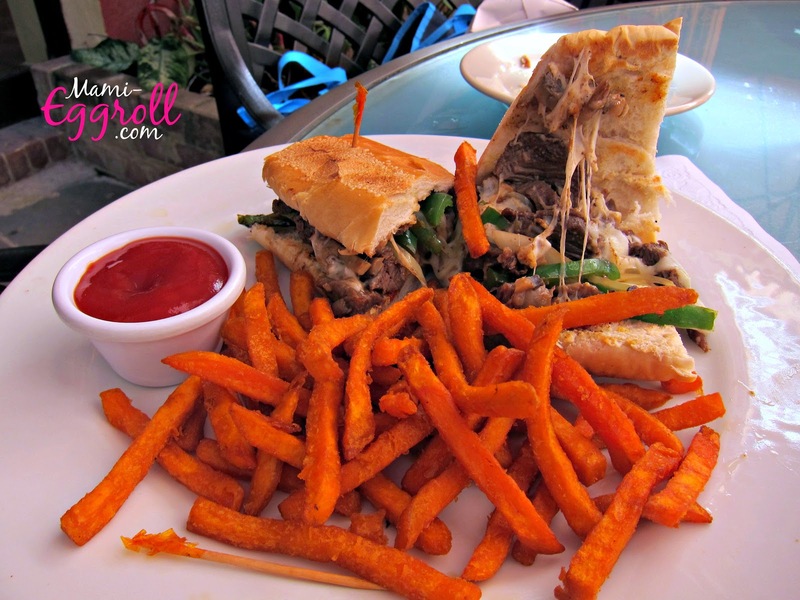 The "Bistec Criollo" was a thinly sliced skirt steak with sauteed mushroom, onion, peppers and cheese on a french roll. He liked it very much but couldn't finish it. 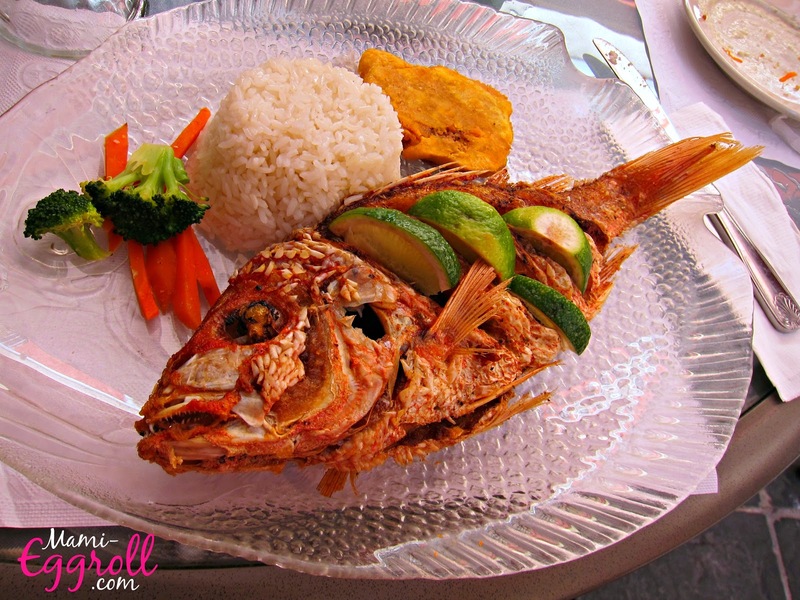 My mother had the fried whole 24oz red snapper with rice and beans. I tried some of her fish and the seasoning and spices was great. The fish was crispy and fresh. 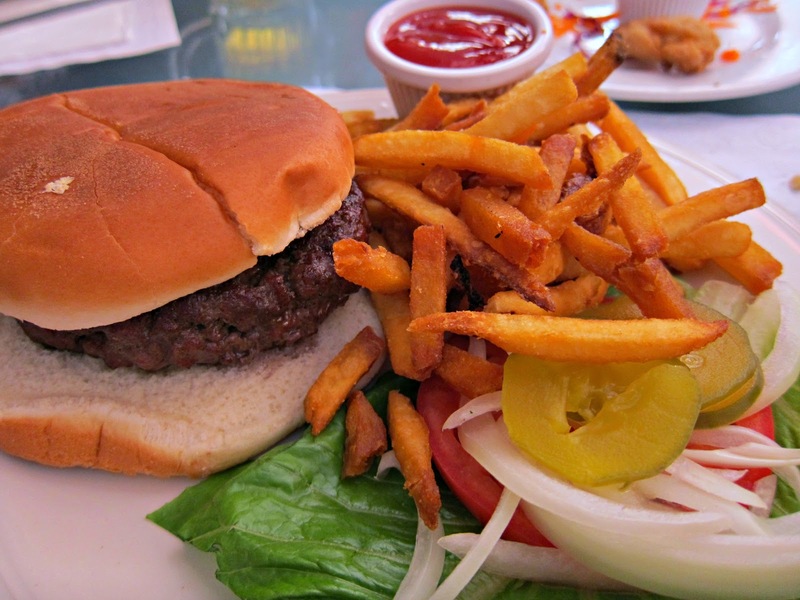 I knew I would be eating the appetizer and everyone else's meal so I ordered a cheeseburger from the kid's menu. To my surprise, they actually allowed it and the cheeseburger was still massive. I still couldn't finish it. The meal was good but nothing spectacular. 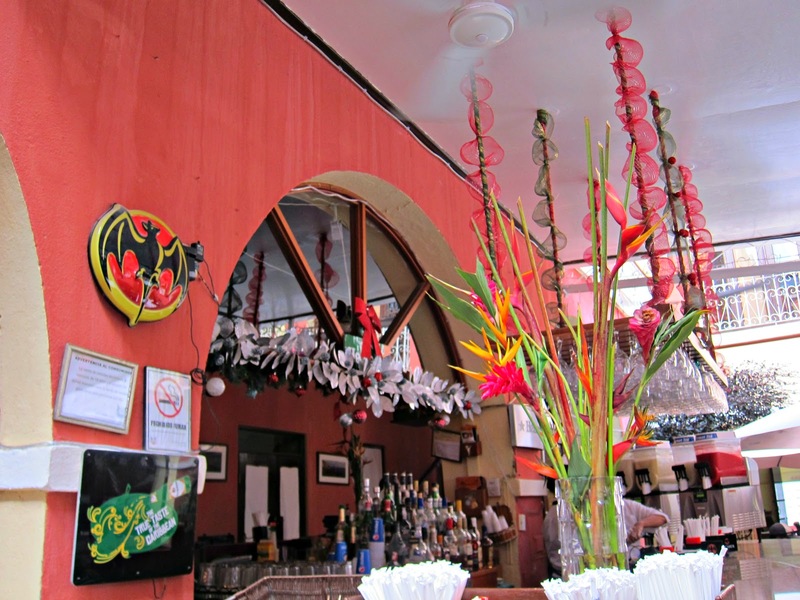 The restaurant had a great ambiance and I was relieved to cross that off my "To Do" list in Puerto Rico. For 2 beers, 2 Pina Coladas, a fried fish appetizer, a Kid's burger, a Steak sandwich and a fried snapper meal, the total came out to $90.00 with tax and tip. Another $30.00 lunch per person. I'm starting to see a trend.